EGYPT, the only country in the Middle East placed in Africa, in the South West of the Middle East starches on 1,001,500 km and has a population of over 75 million (06/2007). About 90% are Sunnite Muslims and 9% Christian Coptic Orthodox. Most of EGYPT is an uninhabited desert and most of the population in EGYPT is crowded along the Nile and its delta in the North of the country on the Mediterranean. EGYPT has a grandiose 6,000 years of history as a main political power in the Middle East, most of the time as an independent local super-power and in the rest of the time as the most important province of foreign imperial powers. Therefore the EGYPTIANs have a strong pride of their national identity and their leading role in the Arab Middle East. From the early 20th century and with the foundation of the Muslims Brotherhood in EGYPT in 1928, there was a strong support in poor EGYPT that true Islam is the right solution to the social, economical and political problems of EGYPT and the Muslim World that EGYPT is leading. 1979 was a traumatic year for EGYPT. The tremendous success of the 01/1979 Islamic Revolution in Iran, led by Ayatollah Khomeini, to expel the Shah and the American influence from Iran and to establish in Iran an Islamic state. Islamic motions were intensified all over the Muslim world including EGYPT. Just two months later, on 03/26/1979, the EGYPTIAN President Anwar Saadat signed in Washington, USA peace treaty with Israel. In the eyes of many devoted Muslims EGYPT, the proud leader of the Arab and Muslim World, betrayed the Arab Muslims and their historical duty and gave in to heretic Israel for the benefit of American money, which will be followed with Western Influence. The peace treaty with Israel provoked a strong, violent Islamic opposition against the EGYPTIAN regime with bloody terror attacks against government and economical targets in EGYPT. New Islamic organizations merged and gained power in the EGYPTIAN society like the EGYPTIAN Islamic Jihad or the EGYPTIAN Jamaa Islamiya. On 10/06/1981 President Anwar Saadat himself was assassinated in Cairo, during a military parade, by fundamentalist soldiers. The leading assassin Khalid El-Islambouli, an activist of the EGYPTIAN Islamic Jihad is considered by Islamic militants a hero and a model. Following Anwar Saadat assassination EGYPT plunged to a long bloody anti terror campaign. Those who managed to flee EGYPT or were released from jail and left the country, like D”r Ayman Al Zawahiri, are today the spinal cord of the Global Jihad all over the world. 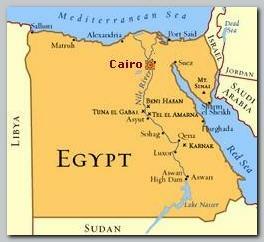 * Today (06/2007) EGYPT still suffers from Islamic extremist activities. The Muslims brotherhood as an organization is outlawed but the activists are operating under other names and organizations. The police and security services are monitoring closely their activities and the leaders are arrested for interrogations from time to time. * EGYPT still suffers from Islamic terror against economical targets, especially tourist resorts in Sinai Peninsula, although in low dosage. * The stability of the EGYPTIAN regime is not granted and any unsuspected political turmoil in the Middle East can result in profound political changes in EGYPT.